If there is a Doberman in need Doberman Underground is there. Sounds pretty simple right? You would think so, but unfortunately not all Dobermans we rescue can be adopted out to loving forever homes due to costly medical conditions. And that is fine with us. 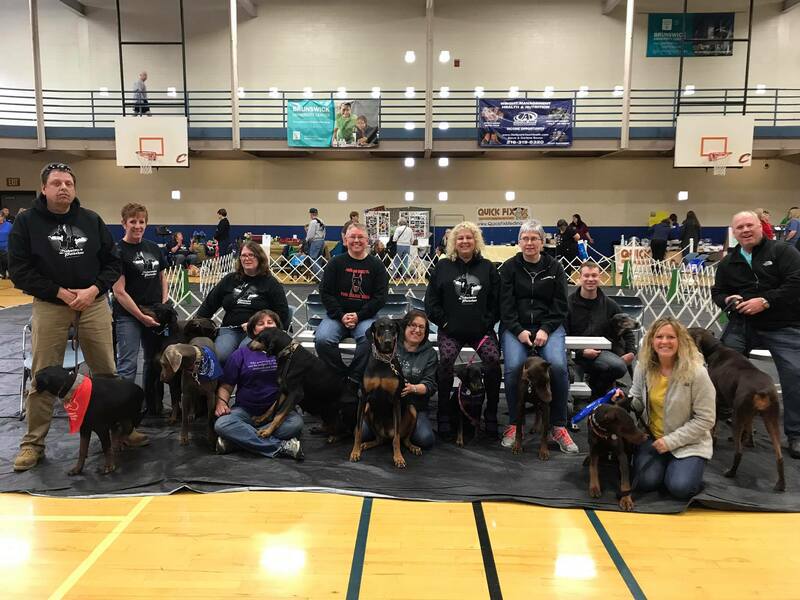 Because at the end of the day we have rescued a Doberman in need and they will spend the rest of their lives being loved and cared for in a hospice foster home. And isn’t that what rescue should be all about? Unfortunately with the good comes the bad and there is a down side and that is primarily our medical costs. Contrary to popular belief very few vets provide discounts to rescues. And while some people will believe that rescues receive government funding or have corporations knocking down their doors the truth is that 90% of our funding comes from people like you, 3% from Corporations and 7% in-kind donations (physical goods). Without your generosity there would be no us. 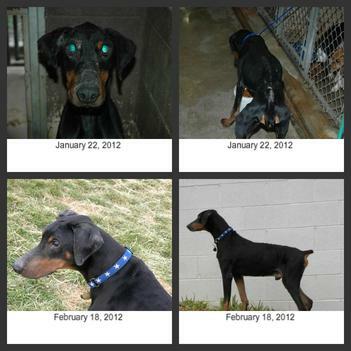 And we thank you for your generosity as it allows us to continue what we love and that is rescuing Dobermans. I was in my backyard on a cool January evening dog proofing my fence from my professional escapee frenchie mix Will. I felt my phone in my back pocket and looked to find a message from a fellow rescuer in Tennessee, Patricia Buchner. She told me of a Doberman in a high kill shelter (98%) in Hazard, KY that needed out the next day. He had been dumped at the shelter the previous Friday evening by someone that never left a name. He was severely emaciated, covered in wounds, and appeared to have a broken left front leg. I was the closest person to that shelter. Could I help? Well, I couldn’t, but I knew someone that could. This was around 8pm in the evening and I called my Dad. “Dad, I need a Doberman picked up. It is a 6 hour round trip. He’s bad. He’s in the middle of nowhere. Can you help?” Certainly. And the process was set into motion. Debra McMahan, in New Mexico, had received the original email about this no-named boy and set his rescue in motion. I was forwarded pictures from Debra. I was appalled. And worried that we wouldn’t get to him in time. I called my vet the next morning and gave them fair warning of a very ill boy coming from Hazard, KY. I didn’t have many details, other than he wasn’t doing well. My Dad arrived at the shelter and after some conversations as to who he was and what he wanted, the no-name boy was in the back of my Dad’s truck seat. He didn’t move. He was covered in urine and feces. He smelled horrible. I called my Dad about every 30 minutes to an hour to see how he was. He wasn’t moving. Dad kept looking back at red lights to make sure he was breathing. Dad gave me fair warning that he didn’t feel the boy would make it to the vet’s office, or realistically survive after he got there for much longer. “Hazard”, as the vet’s office called him, did make it to the office. And the first phone call was to inform me that he was heartworm negative. And his blood work didn’t really look that bad. And his front leg was an abcess from a bite. This boy was most likely a bait dog. He was covered in wounds that were in different stages of healing. He was hooked up to IV’s, started on a triple cocktail of antibiotics, and laid to rest comfortably with some soft blankets in a quiet corner of the kennels. The fight was on to save this boy. And none of us were giving up easy. The next morning, I called the vet’s office to see how “Hazard” was doing. He did ok through the night. “And he’s blind”. I was stunned. I was silent. A million thoughts were racing through my head. This boy was in this bad of condition and he was blind on top of that? When he was fed the evening before, he had to use his paw to find the food. He could see nothing. I and my rescue were unfazed. This boy was going to survive and hopefully thrive. I was at the vet’s office that evening telling him that not only me and my family, but a world of people was behind his recovery. The only way that I know to describe this dog at that time was that he was a shell of himself and was in survival mode. There was life there, but barely. He weighed a whopping 46 pounds at this point. After two full days at the vet’s office of IV antibiotics, IV fluids, and mountains of food, “Hazard” was declared well enough to go home. That quickly, this amazing boy was recovering. It was not safe enough to know if he would fully recover, but there was nothing that the vet could do that I couldn’t. When I went to pick him up, three of the vet techs brought him out on his lead and formed a wall around him. They wanted to know exactly what would become of this boy and where was he going? A very quick attachment and bond had formed between his caregivers and him. I assured them that no harm would come to the boy and that my rescue would ensure that he was completely healed and well cared for. I was afraid they wouldn’t let me have him. So I brought him home to the “kitchen ICU”. He was made a bed, given several soft blankets, and a “cat scan” by my cat Gus. Following the advice of a vet, I fed the newly anointed “Phoenix” all that he would eat. At one point, he was eating between 10-12 cups a day of high quality food. His bowl of food and water was never empty. He still remained a shell of the dog that was to be, but at least he could stand and start going on some very short walks. Phoen’s leg healed slowly and required a couple of different antibiotics. He remained on pain medications and his joint would swell if he was too active on it. We feared that he would have to have surgery to clean the joint out. But he started to gain some weight and come to life a little more. He was goofy and clumsy at first. Everything was new and he needed to smell it all. Even though he couldn’t see any of it. When Phoenix became well enough, we loaded him in the car and headed to Medvet in Columbus. His eyes needed a work up. Everyone was curious to know if Phoenix could regain any site. After a brief visit with the ophthalmologist, I was informed that he had suffered a blunt force trauma to the head, causing his retinas to detach and atrophy. Phoenix could see nothing. No light, no shadows, nothing. The only good news from that visit was that his retinas had managed to move back up where they belong and his eyes could drain normally. This meant that Phoenix would not develop glaucoma. The vet ordered me to take him home, treat him normal, and let him live his life to the fullest. So we do what the vet ordered. Phoenix goes many places. He has met many new people. He still has a following of people from around the world that we update on his progress. He has learned to play with other dogs. He goes on walks almost every evening and has developed a ritual of his own. We race up the last hill. Phoenix is running as we round the curve. He knows his spot to start running every night, and he flies up that hill. The boy, who had no name and could barely walk 7 months ago, is now running, has a warm bed and full belly every night, and is grateful for every moment that he has now. Doberman Underground is a nonprofit, organized exclusively for humane and educational purposes, within the meaning of section 501(c)(3) of the Internal Revenue Code, or the corresponding section of any future federal tax code, including for the making of distributions to organizations that qualify as exempt organizations under section 501(c)(3) of the Internal Revenue Code, or the corresponding section of any future federal tax code and that are organized exclusively for humane and educational purposes.